Environmentalists have raised alarm bells regarding the substantial increase in coal consumption over the past few decades. Due to rising demand in the developing world and emerging markets such as China, coal consumption rose 7.6% in 2010. Among the fastest growing coal consumers were China (up 10%) and India (up 11%). But why such a huge increase in coal consumption? Well, probably the most substantial reasons are economic – coal is one of the cheapest forms of energy generation. It requires lower initial capital costs than hydroelectricity, is cheaper than oil or natural gas, and is far more reliable/available than wind or solar power. It should therefore be no surprise that coal would be attractive to a developing country that lacks significant financial capital. However, coal also brings with it some serious environmental problems. 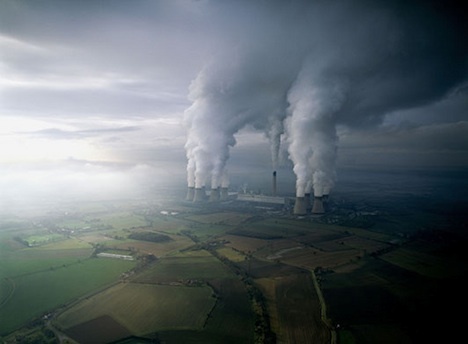 It is an exceedingly dirty fossil fuel that emits high amounts of CO₂ into the atmosphere during combustion. As a result, it is a substantial contributor to climate change. In addition, the extraction of coal emits further CO₂ into the atmosphere while damaging local ecosystems through the process of mining. But despite these environmental concerns, Vietnam (one of the top 11 countries most vulnerable to climate change) has announced plans to sink $83 million into the construction of 90 new coal power plants. Therefore, this rise in coal consumption could be a cause for concern. I said “could” because I believe coal could actually be a viable form of energy generation if the proper measures are put in place. For instance, many scientists have highlighted the ability of carbon capture and storage (CCS) to reduce the CO₂ emissions generated by coal. CCS includes a range of technologies which could trap up to 90% of the carbon dioxide emissions from coal plants. For instance, the process of “oxyfuel” burns coal in an atmosphere with high concentrations of oxygen, thus creating a pure CO₂ exhaust gas. This gas can then be trapped, liquefied, transported, and then buried underground. I have even seen the suggestion made to utilize this liquefied CO₂ in carbonated beverages. Not a bad arrangement if you ask me. My point is, the world is not transitioning to alternatives fast enough to prevent global warming. We need to do things now to curb our carbon emissions, and coal-fired plants in conjunction with CCS can accomplish this to some degree. I’m a big believer in being pragmatic about the decisions we make as we tackle climate change, and coal can be viable intermediary form of energy as we improve the technology of other alternatives. I realize this may be a controversial argument for some people, but would do you think? Is there a place for coal in energy policies of the future? These people have their heads up their arses. Carbon capture and storage has problems on both the capture and storage side. I’m not convinced that the capture can be done on the scale required, for the cost required. Thus I don’t see developing countries ever embracing with technology. Thanks Noel for contributing to the discussion. I think you’ve made some valid points regarding some of the limitations of CCS in coal plants. I’d like to start off by saying that no energy option is without its impacts. Obviously we need to move away from CO2 emissions caused by current energy generation, but renewable technology is not quite there yet. That’s why I’m advocating for a relatively clean intermediary energy source until renewable technology is at the point where it can be deployed large-scale. The way I see it, we can already reduce CO2 emissions from coal generated plants by 85-90% using current technology. Unlike renewables, we do not require a full-scale rethinking of technology, energy storage, and infrastructure. The technology for coal and CCS has been developed for the past few decades. There are still some significant hurdles to overcome, but nothing completely insurmountable. I think it would be a mistake to discount coal as a viable clean energy source in the near future. As far as carbon capture goes, I’ve seen a huge expansion in the literature over the past number of years. Post-combustion carbon capture is currently technologically viable… the beauty of coal power plants as that they are large, stationary emitter of CO2, which makes it easier to capture the carbon, and in fact there are a number of ways to do – I have outlined one of the more promising ways in my article. Granted, it is more expensive to implement CCS for coal plants and energy efficiency can be reduced by 8-9%. But if a proper cost is imposed on carbon emissions in the developed world, this will make these coal powered plants more of an option. Despite all this, coal is still more economically viable/reliable than other renewables at this point, especially given the fact that we still have not discovered an ideal way to store energy generated by renewables such as solar and wind. For more info on CCS, I’d refer you to this article in Science, this editorial, this whole special issue of Science, and this article in Energy Policy… all of which are highly reputable academic and scientific publications. The IPCC has also suggested CCS as a legitimate (even necessary) avenue to pursue to mitigate climate change. There is a lot of proven science behind carbon capture technology. Regarding carbon storage you do present some significant (though in my opinion not insurmountable) issues. In fact there are numerous possibilities for the permanent storage of carbon in underground geological structures – oil companies have been doing it for years to extract more oil from the ground. For instance, there is great promise for CO2 sequestration in deep saline aquifers, which are able to absorb large quantities of CO2 (which would be liquid at these pressures). If dissolved in the aquifer water, given flow rates, it would take a million years for the CO2 to travel even 10-20km. Although it is difficult to estimate the capacity of these deep saline aquifers, experts agree their capacity is huge… perhaps quite close to (or even more than) the carbon stored in the earth’s fossil fuels. So carbon storage is not far off; we can’t ignore these possibilities give the huge emission reductions we can achieve on the technological side of things. The Lake Nyos example you gave is not an example of a permanent geological storage structure scientists are talking about. In the situation you brought up, the lake was the CO2 storage (via underground magma), which caused a dispersion following a landslide. This is not analogous to the forms of storage experts are suggesting, although obviously environmental concerns do still need to be taken into account. I think I’m going to end here, but I will conclude by saying that we can’t just ignore coal with CCS as a viable intermediary form of clean energy. Shifting to renewables full-scale right now is not an option and world energy consumption will continue to increase (despite conservation and improvements in efficiency). We need to start tackling climate change NOW, with carbon CCS since renewables are not quite ready. Please note, I am not advocating giving up on renewables – quite the opposite as a matter of fact. We need to continue research on renewables until the technology is where we need it to be. But in the mean time we need a relatively clean energy source to fuel global demand. In fact, our climate depends on it, if it is not already too late. Also, for anyone interested I would recommend the book Sustainable Fossil Fuels by Mark Jaccard (professor of environmental economics and contributor to the IPCC). I have used much of his research as the basis for my views on energy policy, and he makes some compelling (and well supported) arguments regarding the use of coal with CCS, among other things. This is a complicated issue and our country is still trying to figure out an answer. The Powering a Nation (poweringanation.org) news site is looking into our complicated relationship with coal. “Coal: A Love Story – Can’t live with it. Can’t live without it.” is due to launch July 22. However, there is a blog that is constantly being updated (coalalovestory.com). all of which are highly reputable academic and scientific publications. obviously environmental concerns do still need to be taken into account. arguments regarding the use of coal with CCS, among other things. I take a systems view, rather than an economic/accounting view to carbon & global warming. All carbon can’t be accounted in the same way. Its ultimate source is critical. Fossil fuel burning moves carbon from the geology (where it’s been for between for about 100 million to about half a billion years) to the biosphere where it pushes the carbon cycle out of balance. While CCS tries to reverse that, I done think it can work to the degree needed or safely. and infrastructure is exactly what’s need, so we can again live with the planet’s annual solar budget. I used Lake Nyos to show what a cloud of concentrated CO2 can do. I do recognise that lake out-gassing is a completely different situation. An coincidence of geology & geography. The problem is more human nature that technical. “I can stop using before doing the long term damage could kill me”. The smokers retort.